Mix mayonnaise, basil and mustard together. Season to taste with kosher salt and freshly ground pepper. Whisk olive oil and garlic in another bowl. Prepare grill to medium-high heat. Brush mushroom caps on both sides with garlic oil. Season with salt and pepper. 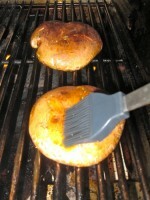 Grill mushrooms until tender and golden brown, 4-5 minutes per side. Transfer to a platter and cover with foil to keep warm. Grill cut side of rolls, if desired. Top the bottom half of each roll with a mushroom, tomato slice and greens. 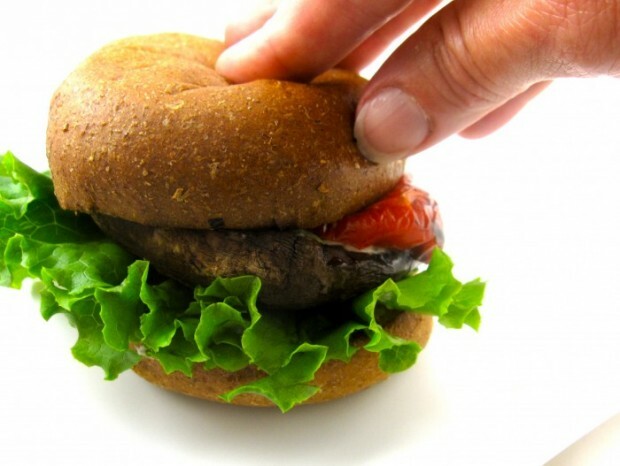 Spoon some basil-mustard sauce over tomato and top with the other half of the bun.